In 2017-18___St. Joseph’s_ School was provided with a PDG allocation of £5200.00. At _St. Joseph’s School we have a comprehensive plan, agreed and monitored by Swansea Local Authority and ERW, to promote progress and remove barriers to learning for students eligible for this funding. 2.1 SENCO support; additional time allocated for withdrawal lessons to deliver literacy programme. 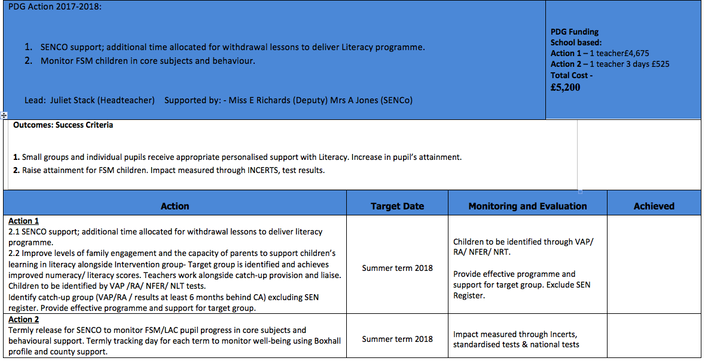 2.2 Improve levels of family engagement and the capacity of parents to support children’s learning in literacy and numeracy alongside Intervention group- Target group is identified and achieves improved numeracy/ literacy scores. Teachers work alongside catch-up provision and liaise. Children to be identified by VAP /RA/ NFER/ NLT tests. Identify catch-up group (VAP/RA / results at least 6 months behind CA) excluding SEN register. Provide effective programme and support for target group. 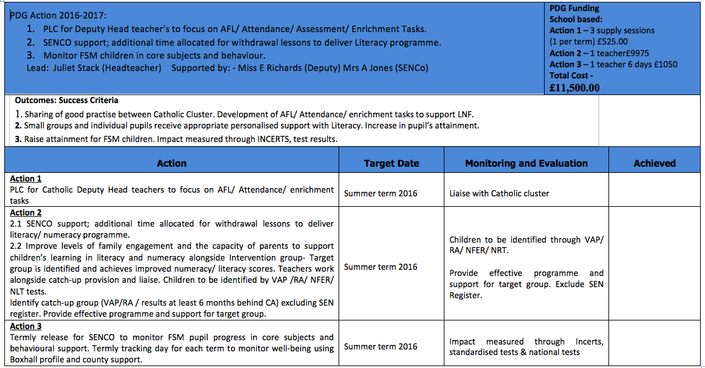 Termly release for SENCO to monitor FSM/ LAC pupil progress in core subjects and behavioural support. Termly tracking day for each term to monitor well-being using Boxhall profile and county support.